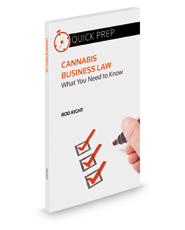 Cannabis Business Law provides a thorough, top-down view of the legal issues that a cannabis business owner can expect to face. Although the cannabis industry grows at an unprecedented rate and the “green rush” is discussed in major media outlets on a daily basis, the law lags behind. As a whole, the cannabis industry faces contradictory laws, unfair tax treatment, litanies of overlapping regulations, an inability to participate fully in some forms of federal intellectual property protections, and limited access to banking services, among other hurdles. Joining the industry without a strong understanding of the law is risky at best. Written in a direct and easy-to-read style by a business lawyer for investors and attorneys, this book addresses complex legal issues head-on and covers all of the major legal issues that are unique to cannabis businesses. Whether you are opening a dispensary, leasing to an edibles manufacturer, creating a state-of-the-art growing system, overhauling a casual co-op into a fully functioning non-profit organization, or becoming involved in the cannabis industry in any number of other ways, this book will benefit you by giving you knowledge of the legal issues that you will face, accompanied by practical methods for dealing with them.